When someone says equities, the first thought that comes to most people’s minds are shares, stocks, bonds not to mention profits. Although this is true to a large extent, the truth of the matter is that equities represent a certain percentage of a company and therefore when the company does well, the equity owner does receive a certain percentage from the profit that the company makes via dividends, however if the company does badly, equity owners will see a depreciation on the value of their ownership. The diverse range of equities that exists in the market are influenced by a variety of determinants that could easily range from a bad management decisions to regional political instability or financial failures and economic slowdowns, but there are some equities that are negatively correlated with these types of situations and most of them are directly or indirectly related to the precious metals industry. This is due to the fact that equities stemming from the precious metal industry such as those from a gold mining company offer a significant amount of leverage in comparison to the direct ownership of the physical metal itself however, bear in mind that gold company related equities are expensive when compared to that of conventional companies due to the fact that they have an imbedded option element or component in these equities to cater for possible rises in the price of the precious metals, especially gold. The sensitivity of the share price to even an imaginary rise in prices of gold is directly correlated with the cash flow derived from current production and hence it will have a significant impact on valuation of proven as well as probable reserves. Thus investing in gold mining stocks may be attractive, but they can also be very tricky as few survive a gold bear market and although rising prices may offer relief it is critical to be able to scrutinise financial statements pertaining to hedging arrangements which could drastically undermine the participation of the company when gold prices are high to a point where it could jeopardize the financial stability of the company. In essence, gold is largely deemed as a conservative investment, nevertheless when the gold bug arrives it attracts a stampede of speculators who in most circumstances separate the investor from his or her money and thus it is always better to avoid out of the ordinary “exploration” companies that have no proven track record and have little or no present production but a big appetite for funds. 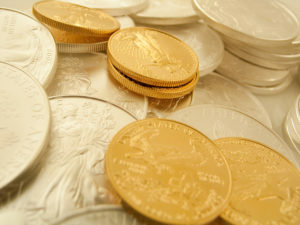 If your fund is small, then the best approach to invest in the precious yellow metal or silver for that matter is via bullion which is definitely the more conservative way to invest in the shiny yellow metal. The plus factor about investing in gold or silver bullion is the higher liquidity levels as there are always other investors who are more than willing to buy gold when economic conditions are good. The only issue associated with investing in the shiny yellow metal is that it requires scrutinizing custodial arrangements as well as the creditworthiness of the financial institutions that manage them.